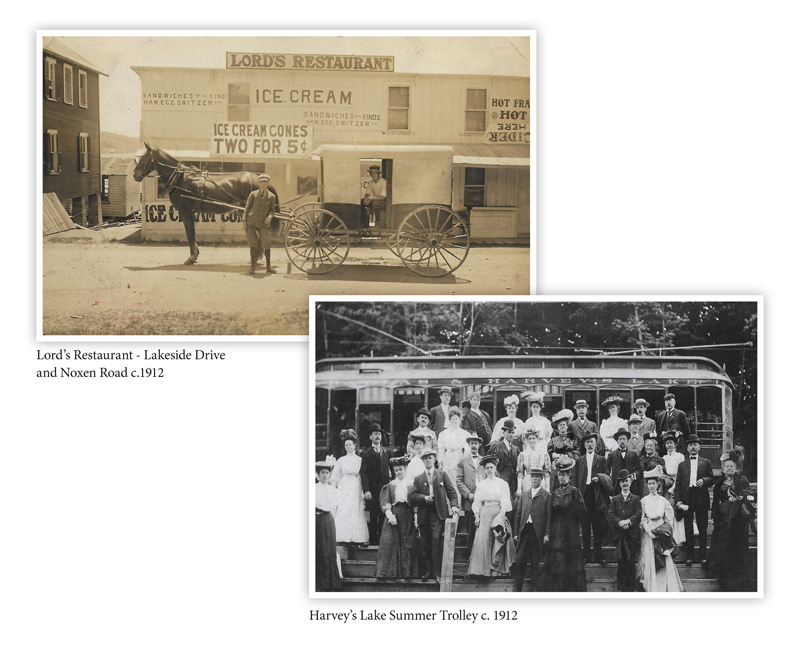 The thirty-three seasons from 1887 to 1919 were the Golden Years at Harvey’s Lake. They began when the resort potential of the Lake was unlocked by the building of a railroad from Wyoming Valley to the North Corner of the Lake. Summer guests were no longer deterred by poor roads and long stage rides, and the Lake quickly became one of the state’s most fashionable resorts. In 1886 Albert Lewis, a timber and ice cutting magnate, purchased large tracts at the North Corner of the Lake. He was a principal in the Wilkes-Barre and Harvey’s Lake Railroad, a twelve mile line from Luzerne to the Lake, which was built to serve the Lewis timbering interests in the Lake area. In June 1887 the Lewis railroad began to run passenger coaches to the Lake; two months later the Wilkes-Barre and Harvey’s Lake Railroad was purchased by the Lehigh Valley Railroad. The Father Matthew Society of Wilkes-Barre, a coal miners’ temperance association, chartered the first picnic excursion over the new line for August 12, 1887. The train signaled a new era for the Lake, but an ominous warning was sent on August 2, 1888, by B. F. Barnum in a letter to George R. Wright. Barnum informed Wright that sewerage was running into the Lake from the increased settlements. The sewerage threatened the ice business and the health of cottagers who used the Lake for drinking water. Barnum questioned whether the Lake patents could be used to half the pollution to protect the Lake’s waters. Despite the question, no formal action seems to have been taken in these early years. In 1889 the Lehigh Valley Railroad purchased a large tract of Lake property from Albert Lewis to build the Picnic Grounds. The Lehigh Valley Railroad had developed other resorts in the region, for example, the Glen Summit Hotel in Mountaintop and Glen Onoko in the Lehigh River Valley. A Harvey’s Lake park seemed a perfect prospect as a new attraction to promote the railroad line. But competition loomed for the Lehigh Valley Railroad. In late 1889 a new railroad, the Wilkes-Barre and Williamsport, began to grade a line through Lehman, with a planned spur to the Inlet. When the new company could not raise sufficient capital to complete the railroad, the unfinished line was abandoned. The Lehigh Valley Railroad’s Picnic Grounds at the Lake opened in 1891 with instant success. At the same time, William Bond launched the Big Boat, a seventy foot steamboat that was twice as large as any previous Lake steamer. 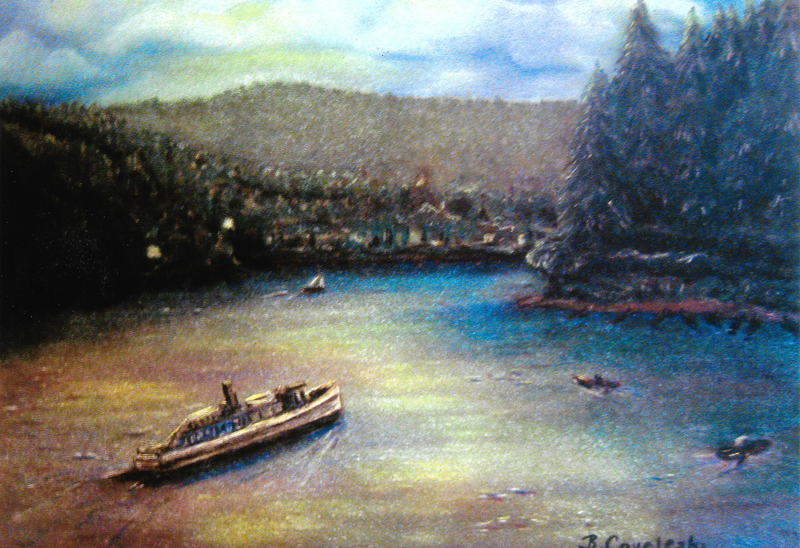 With the addition of the Big Boat, there were three steamboats which served the Lake. The steamers picked up passengers at the North Corner and took them to the Rhoads Hotel or Lake Grove House at the Inlet. The Inlet hotels enjoyed a good business. They also attracted a large number of day guests for catfish or bass dinners. Besides the hotel trade, there were a number of camping parties at various Lake sites, and soon boarding houses were common. But there were also problems. The telephone system was in “miserable” condition. At Outlet Mills, Ephraim Troxell, who controlled the dam, had the Lake too high in 1890 and too low in 1891. For a decade Troxell would be involved in litigation over manipulation of the Lake level at the dam, and eventually the Pennsylvania Supreme Court would have to rule on the matter. During the summer of 1891 considerable controversy arose over a plan to run Sunday trains to the Lake. Some feared that Sunday excursions would attract a rougher element that would disturb the Lake’s tranquility. The Lake community was divided over the issue, and local newspapers took sides on the matter. A vocal supporter of Sunday trains was Col. Jacob Rice, the former owner of the Lake Grove House. As a Methodist his support of Sunday train service was considered unusual, but his community position was considerable. Since the six-day work week was common, Sunday was the only time most workers could enjoy the Lake, and Sunday trains followed. By late April 1892 the catfish were biting, and later in the season large lake trout, stocked in the Lake in 1887, were being caught. There was a rumor, or perhaps a local joke, that the old log bridge at the Inlet would be dismantled and taken to the World’s Fair at Chicago. By May a new post office, called Laketon, was opened at Perrego’s at the West Corner, and the Outlet post office was discontinued. C. F. Cook, a popular Wilkes-Barre photographer, erected a photograph gallery at the Picnic Grounds. The Forty Fort Band, organized in 1889, held a large picnic at the Lake, an annual tradition for the next two decades. But, of course, it was not an ideal season. The Inlet bridge was in disrepair and unsafe, but Samuel Gottfried, the new owner of the Lake Grove House, was securing support for a new iron bridge. The consumption of “hard cider,” which was less costly than beer, was also a problem at the Lake. In the spring of 1893, Walter M. Dickson, of Scranton, made a two dollar purchase at a New York City auction that created a local sensation. Dickson bought a map of Pennsylvania, originally published in London in 1775 and believed to be “lost” until Dickson obtained it. The map depicted Indian villages along the Susquehanna River in the Wyoming Valley, as well as Indian paths from the valley to other Pennsylvania Indian villages. The map stirred a local controversy because it disclosed a large lake near Wilkes-Barre. The Lake was named Shawanese, and on its east bank was an Indian village called “Old Shawanese Town.” An early Indian tribe in the Wyoming Valley was the Shawanese who came from the Ohio River Valley between 1700 and 1735. The Indians settled on a level plain along the Susquehanna called Shawanese Flats at Plymouth. To many observers the lake on the map was undoubtedly Harvey’s Lake. Many remembered that Henry Worthington, whose father settled near the Lake in 1806, claimed his family found Indian relics on the land when the fields were plowed. Indian relics were also found at the North Corner, West Corner, Outlet and at the Inlet. With the discovery of the map, attempts were made for the next few years to change the Lake’s name to Shawanese, supposedly its original Indian name. This was the second effort to change the name of the Lake. Several years earlier, in the late 1870’s, there was an abortive effort by a local newspaper writer to change the name of the Lake to Skandara, a bogus Indian name. But the Shawanese name caught the public imagination. A leader for the change to Shawanese was George R. Wright, a prominent lawyer with varied corporate interests. Fifty of the older Lake residents signed a petition to approve a name change, but Wright was unsuccessful in renaming the Lake. Under Wright’s considerable political influence, however, the Lake post office was renamed Shawanese on January 12, 1894, with his friend, Charles E. Rhoads, as postmaster at the Rhoads Hotel. Within a year Wright also persuaded the Lehigh Valley Railroad to change its timetable to list the Lake station as Shawanese Lake. An improving road system continued to aid the Lake, although a trolley line would not reach the Lake until 1898 when the line to the Oneonta station was opened. The Lake Transit Company, a steamboat line, launched the Rosalind in 1893 to compete with Bond’s Big Boat. At this time the Lynde family of Scranton placed a naptha launch on the Lake, which signaled the beginning of privately-owned powerboats on the Lake. Shortly, Dr. Olin Harvey added the Ophelia, a launch he used for professional house calls around the Lake. For July 4, 1893, the Lehigh Valley train for the Lake left Wilkes-Barre at 9:15 A.M. The railroad has a six-car train filled, followed later by a five-car train. The Lake road was filled with horse-drawn wagons and bicycles, and the shoreline was flowered with picnic baskets. In 1895 the Lake Transit Company purchased the Big Boat, and under Wright’s influence the steamer’s name was changed to Shawanese. On July 4, 1895, over seven thousand people visited the Lake. The steamers were overrun and could not handle the crowds. The holiday crowd was disappointed when the hot-air balloon demonstration was cancelled. The event had been advertised by the Inlet hotels. The crowds did not learn until the next day that the balloonist had fallen from the airship earlier in the week at Hobbie. At this time a local institution was begun by George S. Renard, a former coal company blacksmith, who formed the Renard Band of Ruggles. For a number of years Renard’s Band enjoyed local renown at the Picnic Grounds and at the Dallas Fair. The band also played at the 1905 Acoma steamboat dedication and for holiday celebrations. Composed of local farmers, laborers and tradesmen, the band had a succession of leaders after Renard’s death, and in later years it was also known as the Pioneer Band and as the Ruggles Band. An extended article on the Ruggles Band will appear in www.harveyslake.org. 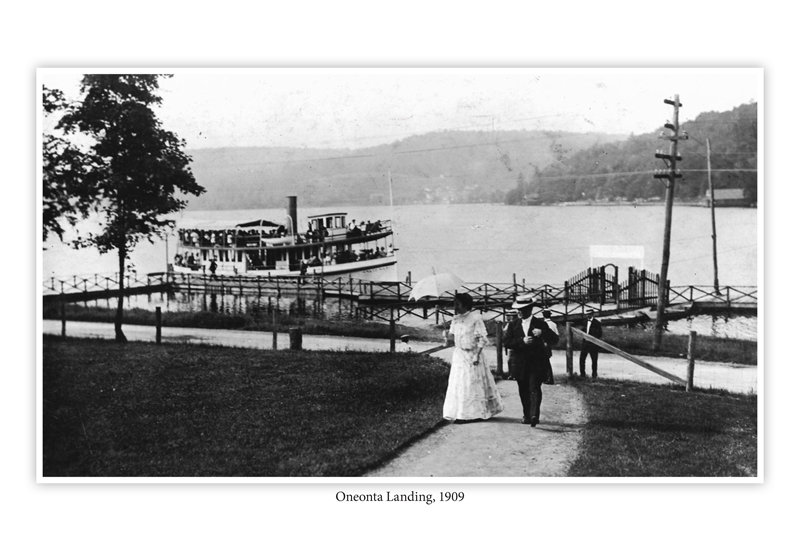 Near the close of the century, the greatest event at the Lake was the opening of the Hotel Oneonta on April 14, 1898. The four-story structure was owned by the Harvey’s Lake Hotel and Land Company. The 1898 season was considered the most attractive in a quarter century. Ralph Derr launched an impressive twelve-passenger naptha launch. 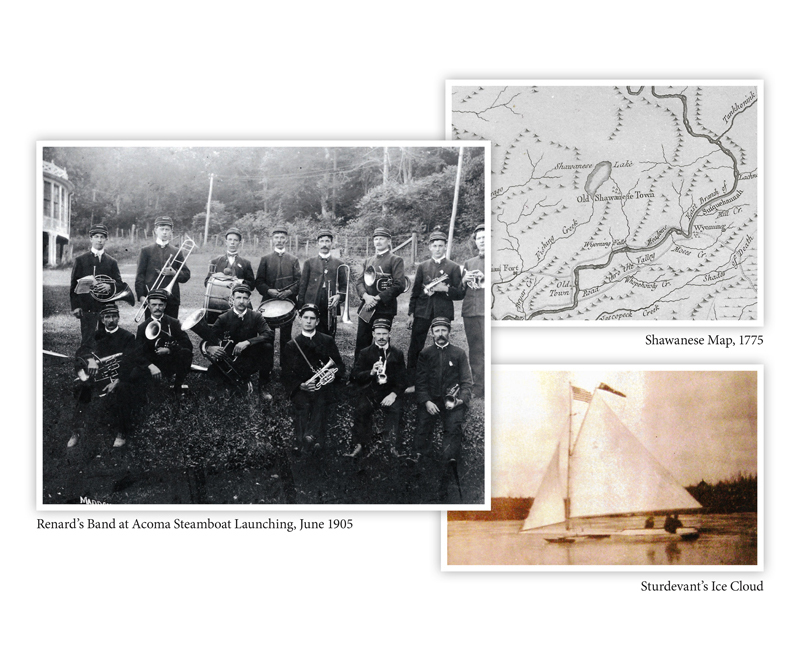 The Shawanese Boat Club, which was organized in August 1897, planned a sailboat race for the July 4 holiday. An “old-fashioned” picnic was also scheduled for Independence Day, with an afternoon band concert and evening dance at the Rhoads pavilion, followed by fireworks. Tony Baur opened a rowboat and canoe concession for the season. Maintenance of roads was always a problem, and Albert Lewis had a labor gang repair the road at Alderson. The pilothouse of the Shawanese steamboat was remodeled for the season. The steamers also began to run evening excursions for the hotel guests. A popular site in 1898 was Burnett’s bathhouse and photographic studio, which was located on the shoreline above the Picnic Grounds. By Christmas 1898 there were 162 buildings around the Lake including the West Corner, Lakeside and Alderson Schools, the Methodist-Protestant Church at West Corner and the Alderson Methodist Church. Six drownings had been reported at the Lake since its discovery including a tragic double drowning on June 23, 1898. Gowan C. Herdman and Lewis McCarty, two young men from Dallas, were riding horses in the shallow water near Alderson when one of the horses stumbled and in the ensuing panic both boys were drowned. They drifted and sank in deeper waters. William Bond and his steamboat were summoned. Bond ignited two sticks of dynamite and dropped them into the Lake. The explosion brought the bodies to the surface for retrieval. The last year of the century had a surprisingly late winter with one foot of ice still on the Lake in mid-April. In late July, a new physician, R. H. Jackson, moved into L. B. Avery’s drug store at Alderson. An attractive bathing beach was also developed by the Lynch family at their lakefront property at West Corner. In the fall the trolley conductors on the Lake line were pleased with a new daily wage of $1.70, an increase of ten cents a day. In 1899 a local historian, Oscar J. Harvey, wrote the history of Benjamin Harvey’s discovery of the Lake, and also demonstrated that the lake on the “lost” map of 1775 was Lake Gonaga, near Rickett’s Glen, and not Harvey’s Lake. After the Harvey disclosure, the name Shawanese Lake rapidly fell into disuse, and in two years the Lehigh Valley Railroad would abandon the Shawanese name in its timetables. But he Shawanese post office continued to operate for another 100 plus years. As the twentieth century began, there was more growth at the Lake. Only the Inlet hotels had received liquor licenses, which was the usual rule, but everyone knew that illicit sales would be common elsewhere, especially near the Picnic Grounds. By early March, most of the scarce rental housing was already booked for the summer season. Oppenheim’s Orchestra was engaged by the Hotel Oneonta for the season. In mid-May the Rosalind began to run regular trips from the Oneonta landing to the Picnic Grounds, but the steamboat was also stopping at Boyd’s, the new public landing near Alderson. The double-decked steamer, Natoma, was launched in June 1900. The steamboat company offered free rides on the Natoma on June 30 to show off the proud addition to the Lake fleet. Reuben Shafer, captain of the steamer fleet, gave first-class attention to the guests of the Rhoads and Oneonta hotels. Near the Picnic Grounds, George Burnett’s addition to his restaurant, built over the water, was rented to Michael Dougherty as an ice cream parlor. By mid-season Troxell completed the stone dam on Harvey’s Creek, below the Outlet dam, for his grist mill operation. The new dam apparently replaced an older dam built by the Hoffman Company. C. F. Thomas, who operated a gunsmith shop in the winter at the Rhoads Hotel, complained that lake trout were destroying the bass and other game fish. With the 1900 season the Lehigh Valley Railroad improved the Picnic grounds and added a baseball field. All the hamlets in the area—Dallas, Alderson, Laketon, Lehman—had baseball teams that competed at the Picnic Grounds. On August 4, 1900, a “monster picnic” was held at the Lake to benefit the Mercy Hospital of Wilkes-Barre. An estimated twenty thousand people overran the Lake. The Lehigh Valley Railroad, using sixty-eight coaches, brought seven thousand passengers to the Lake between 7:00 A.M. and 10:00 A.M. In Wilkes-Barre the crowds waiting to board the trains swayed “like a great wheat field in the breeze.” The Morril Band of Plymouth played at the Picnic Grounds, and the dancing pavilion was crowded all day. The return trains began at 3:00 P.M. and ran until 7:00 P.M.; with a few revelers arriving home at 11:00 P.M. The general manager of the railroad left the Lake in his own train car in darkness at 9:30 P.M. He carried the day’s receipts, which earned $12,000.00 in profit to pay the hospital’s entire building debt. Other special groups also enjoyed the Lake’s amenities. In early September 1900 the survivors of the Civil War’s 143rd Regiment, Pennsylvania Volunteers, held a reunion at Rhoads Hotel. The regiment came exclusively from Luzerne County. On the first day of battle at Gettysburg, the regiment had a seventy-five percent casualty rate. It was an unlucky winter since it was mid-February 1901 before there was sufficient snow for sleighing. But ice-cutting was active and the ice was twelve inches thick. The Kern dairy alone cut one hundred tons for its farm. John Anderson was rapidly filling his icehouse, as he planned a new ice-wagon delivery service at the Lake for the summer. In the early New Year 1901 the Harvey’s Lake Ice Yacht Club was formed and led by Commodore Robert Sturdevant. The club raced specially-built sail boats on the Lake. Sturdevant’s Ice Cloud had 641 square feet of sail with an ice blade runner 26 feet long. The boat weighed 2,600 pounds. Built by the Vulcan Iron Works in Wilkes-Barre it promised sixty miles an hour on the Lake ice. While the Ice Yacht Club apparently was short-lived, winter ice-yachting occurred periodically on the Lake through the pre-World War I era. In late March 1901 the steamboat company was preparing the boats for the season. The fleet captain, Reuben Shaver, who loved to fish, was able to boast that he caught 150 lake trout during the winter. As the season opened, Michael Doughtery was building his own shoreside restaurant near the Picnic Grounds. The Natoma, which was imprisoned in its boathouse by high water earlier in the season, finally made its appearance on the Lake in mid-July. A local delegation called the Law and Order League proposed a vigorous campaign against beer stands, gambling devices and other unlawful enterprises at the Picnic Grounds. By the end of the season both Burnett and Dougherty would be charged by Constable Frank Kocher with operating “tippling” houses. But the county grand jury mysteriously ignored the charges. The season ended with cottagers successfully defeating a plan to run a trolley line around the entire Lake—a plan which had the approval of the township supervisors. In late March 1902 James Larkin, a handy-man employed by the Lehigh Valley Picnic Grounds, was found dying from stab wounds in his hut near the park by neighbors who heard Larkins’ last pleas for help. He had spent the night drinking whiskey with an acquaintance Samuel Keller whose clothes were covered with blood. Keller explained that a third unidentified man also spent the night drinking in the hut and Keller had just found Larkin with a slit throat, blood-soaked clothes and near-by bloody knife. Keller was awakened by Larkins’ screams. Larkin died moments after the neighbors discovery. Keller was charged with murder. Keller had no previous violent history and many doubted he could be a murderer. Keller claimed he fell asleep in a drunken stupor leaving Larkins and the third man still drinking. In mid-April 1902 a Luzerne County grand jury found the evidence too circumstantial to indict Keller. A few days later Keller was arrested for public drunkenness. The third man was never discovered and Larkins murder was never solved. The 1903 season brought the Wilkes-Barre and Kingston, twin steamers launched by a new steamboat company. The Rhoads Hotel was repainted for the season, and the first lake trout of the spring, four and one-half pounds, was caught by Calvin Dymond, an owner of the new Harvey’s Lake Steamboat Company. A macadam road around the Lake, which had been planned for at least ten years, was finally to be realized as a cottage association provided generous financial support to start the paving project. Major contributors were W. L. Raeder, Albert Lewis, T. L. Newell, George R. Wright, Andrew Hunlock and Ephraim Troxell. Progress on completing the road, however, would be slow over the next few seasons. A macadam road in the early 1900’s was really a rough gravel and tar mixture, not the hard familiar asphalt of today. A truly hard road around the Lake was years away. In early 1903 the Catholic Total Abstinence Union camped on the Wilcox farm near the Hotel Oneonta. Five temperance drill companies, comprising three hundred uniformed men, were an impressive spectacle that drew thousands of visitors. A picturesque military mass drew hundreds of cottagers and hotel guests. Late in the year, Frank Rhoads, who had served as the Shawanese postmaster since the fall of 1902, resigned the office and William J. Hill was named to fill the vacancy. Representatives of the golden days at the Lake was July 4, 1905. The heaviest trolley traffic in the region was on the Harvey’s Lake line, as thousands of Valley residents rushed the trolley cars at Public Square from day break to dusk. Hundreds walked to the Market Street Bridge or to Kingston to grab an incoming trolley car to the city, and to hold tight to a seat as the record-breaking crowds at the Square sought a toehold on the trolley cars. The local newspapers admitted an inability to describe the scene. Women and children were often pushed aside in the rush, and a wait for hours for a seat on the Lake trolley was common. Fortunately, no injuries were reported. At the Lake the new steamer, Acoma, was working its first holiday. The Irish games were scheduled at the Lake for the holiday, which contributed to the mass excitement. A sky-rocket landed on the roof of the M. P. Church at West Corner during the evening and the church was destroyed by fire. The traction company was forced to run return trolleys from the Lake throughout the night to bring the revelers back to the Valley. Still, despite the holiday crowding, the Lake’s popularity as a regional resort was on the rise. Much of the Lake’s growth as a resort could be credited to John A. Redington, a hotel and tourist entrepreneur who had his own hotel in the city and who had managed the Hotel Oneonta for a time. The railroad leased the park to Redington in 1906, and for two decades Redington and his park manager, Charles Lee, tirelessly engaged picnic excursions for the summer at the Picnic Grounds. The excursions generated huge demands for train and trolley service and for hotel, restaurant and amusement facilities at the Lake. In 1906 Charles Lord began a forty year reign in the restaurant business on the shore line near the Picnic Grounds. His familiar restaurant was located between the Doughtery and Burnett stores. An adjacent landing became a regular stop for the steamboats. Lord’s was a popular sandwich and ice cream shop; two ice cream cones cost five cents. The Lake was more than a resort; it was also a community wrestling with transitional pains. In 1907 the township voted against graded schools in the district. The Alderson saw mill now carried the responsibility for the lumber company’s milling from Stull because the Bowman’s Creek mill had burned down. The landmark Rhoads Hotel was destroyed by fire on January 4, 1908, but within a few years new hotels, the Avon, Lakeside and Tabard, would be in operation. In June 1908 the Lakeside schoolhouse near the Picnic Grounds was taken down so its lumber could be used to build the four-room Laketon school at the West Corner. E. R. Troxell, still involved in controversy over the Outlet dam, dropped the Lake by two feet, renewing the long dispute over the Lake level. In 1909 the two steamboat companies consolidated. The Lake Transit Company emerged with a monopoly on steamboat travel, but low water created problems at certain landings in early August. Tourist traffic was heavy, and the Lehigh Valley was running a daily excursion train to the Picnic Grounds where a ferris wheel and roller coaster were under construction. In the fall the Odd Fellows organized a lodge near Outlet at the Alliance Hall, and boys trapped muskrats on the Lake for thirty cents a pelt. By early April 1910 the Acoma was already running on Sundays with regular service scheduled for May 1. The new Kunkle butcher, William Shoemaker, was making trips around the Lake each Monday, Wednesday and Saturday, while I. A. Rood was enlarging his Laketon store. The trolley line ran cars from the Lake to the city each day beginning at 7:40 A.M.
Of course, problems accompanied growth at the Lake. The Law and Order League made arrests for gambling and liquor violations at the Picnic Grounds. The automobile began to make regular and sometimes unwelcome appearances. Although Paul Kraft, Elisa Williamson, Arthur Stull, and Albert Stull were the only Lake residents to own automobiles, residents and guests were constantly blinded and choked by dust clouds as summer visitors with their own automobiles speeded along the Lake road. On July 4, 1910, the first automobile fatality was recorded. A White steam-car broke down on the road near the Hotel Oneonta. As the car was being towed, it broke loose and ran down the Lake embankment. Several passengers in the disabled car escaped, but George H. Callahan, foreman of the Wilkes-Barre Lace Mill, was fatally injured and trapped when the car flipped over into the Lake. The Lake’s golden crest continued in the 1911 season. On July 4 nearly three thousand attended the C.T.A.U. and Rowley’s Band picnic at the Lake. The traction company had a band at Oneonta Park near the trolley station. Hundreds gathered all day at the Hotel Oneonta to enjoy the grounds and stroll through the reception area. During the summer, moonlight dances were regularly held at the Oneonta Park pavilion. The Hotel Oneonta had Oppenheim’s Orchestra each Wednesday and Sunday evening from 8:00 P.M. to 12:00 A.M. In late August, Ralph Snyder of Wilkes-Barre made an unprecedented round trip swim between the Oneonta Hotel and Alderson without leaving the water. The boxing craze hit the Lake with Al Dewey and Kid Wagner training at the Rhoads tavern; Battling Gates was training at the Picnic Grounds. The sparring matches were drawing increasingly larger crowds prior to a prize match between Dewey and Gates at the Luzerne Theatre in mid-August. Swoyersville’s Dewey won the six round match over Edwardsville’s Wagner with Dewey taking four rounds over Wagner. The trolley line opened a new short route to the Lake in 1912, and in the summer months it planned to run regular cars every forty minutes, with express cars leaving Public Square each hour between 6:30 A.M. and 6:30 P.M. Krumbeigle’s boarding house at the West Corner was attracting guests from New York and Philadelphia. In early September, the New York Central Schuetzen Corps of New York City, a famous singing group, joined the local Concordia Society for a music festival at the Hotel Oneonta. Additional improvements were evident in 1913. On Memorial Day hourly trolleys left Public Square from 5:00 A.M. to 11:00 P.M. The Hotel Oneonta, under the management of James Poland, advertised both the American and European plans. The evening crowds filled the return trolleys after 6:00 P.M. The last trolley left the Lake at midnight. For the new season the expanded telephone exchange moved to Hill’s Pavilion at Sunset. Although motorists complained about the Lake road, the iron bridge at the Inlet, in poor condition for the last few seasons, was repaired, and plans were made for a concrete bridge to replace it. A new bathhouse was built at the Picnic Grounds, and a fence was built thirty feet in the Lake around the Shoot-the-Chute to keep bathers from entering the danger area. F. J. Weckesser launched a powerful new motorboat that impressed the summer crowds. 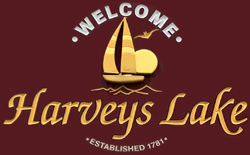 The Harvey’s Lake Club, incorporated earlier in the year to promote water sports at the Lake, planned summer contests. Plans were underway for the July 4 boat races, and the Hotel Oneonta renovated its boat landing. Camping areas were a popular alternative to the hotels and boarding houses, and Jungle Camp near the West Corner was enlarged for the season. In late June 1913 crowds were attracted to Lynch’s beach to observe the immersion of twelve Plymouth residents as they were baptized by Rev. B. M. Johns of the First Methodist Episcopal Church of Plymouth. Later in the month another immersion would be held at the Outlet for local residents under the auspices of the First Baptist Church of Wilkes-Barre. On July 4 the railroad ran two six-car sections and five four-car sections for the annual C.T.A.U. picnic at the Lake. Independence Day had a special variety of entertainment at the Picnic Grounds. The County Sheriff raided the fortune-telling tent of “Mademoiselle Lorenzo.” The twenty-five year old woman was actually Harriet Arnold from Owego, New York; she sold the future for one dollar. At midnight, a disturbance again brought the Sheriff from Wilkes-Barre to the Doughtery restaurant near the Picnic Grounds. The occupants were arrested for running an unlicensed “speakeasy.” Several days later eighteen year old Alice Crispell was found drowned in the water near the Weckesser boathouse. She apparently was in the water since July 4. A boyfriend, held for murder, was released for lack of evidence, and the mystery of Alice’s death was never solved. The Crispell death is noted at length at www.harveyslake.org. Since Alice Crispell met her unfortunate death at Harvey’s Lake, cottagers in the section of the scene of the tragedy [Near the Oneonta Hotel] have placed lights along the shore front to prevent the possibility of a similar occurrence. The chief complaint of the cottagers, however, and a complaint that is fully justified, is that rowdyism is unrestrained at this popular resort. Pleasure seekers journeying there for a day’s outing too frequently lose all sense of decency and self respect. Women are often insulted and life for the cottagers dwelling close to the traction company and Lehigh Valley picnic grounds is made unbearable by these rowdy demonstrations. The freedom of the county atmosphere, doubtless encourages such lack of restraint and lawlessness. The inadequacy of police protection at the Lake also contributes to this hoodlum-like behavior. On holidays the days are made unpleasant and the nights are made hideous by the conduct of the lawless element. It is only fair to the cottagers at the Lake that some restrictive influences should be brought to her to compel the cessation of rowdyism and lawlessness. Steps should be taken to provide adequate police protection. Even one-day picnickers and pleasure seekers resent having their holiday in the country spoiled by those who, through purely selfish motives, disregard the rights and comforts of others. In time concerns expressed in the editorial would lead to creation of the Lake’s protective association to self-police the Lake scene. As the 1914 season opened in early June, the Warden Place landing, damaged by winter ice, received repairs. A new hotel at Warden Place, the Lakeside Inn, was opened by Martha Schworn. It was another full season of events. George Casterline purchased a new Ford truck to provide taxi and baggage service. The county commissioners awarded a contract to build a long concrete bridge at the Inlet. While a two-week retreat for area priests was held at the Hotel Oneonta in June, the hotel was closed to the public. In July the State Water Commission sounded the Lake and found the deepest point to be 102 feet. On September 22, 1914, a “double-header” trolled express and a work-car collided on the Lake line near Troxell’s Switch, killing the trolley line Superintendant , E. G. Ervin, who was temporarily manning the controls while the regular motorman had lunch. The 1915 season was especially active. On July 5, 1915, there were fifteen thousand people at the Lake, and four major hotels—Oneonta, Lakeside, Avon and Tabard—were filled. 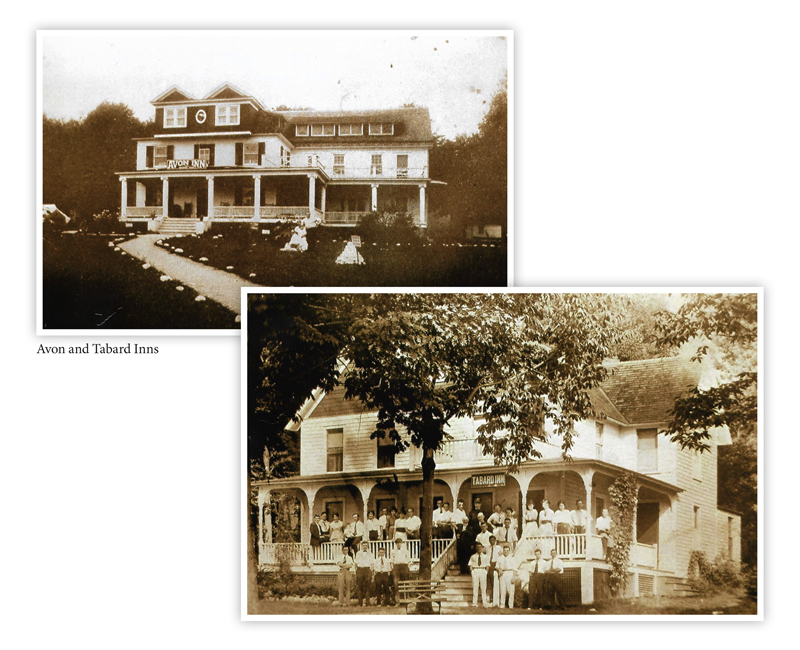 The Tabard Inn, decades later the site of the Harvey’s Lake Hotel, was originally operated by John and Isabella Merical from 1909 to 1921. The Avon Inn was located on a hill overlooking the Lake near the Picnic Grounds and had a pleasant small resort atmosphere. It was developed by Noah and Dora Raskin, and would be expanded to become a popular vacation spot with over fifty acres of ground. In 1915 the old Rhoads landing was repaired after several seasons of disuse; it became a regular stop again for steamers. In June the launch Emily began to meet the first trolley passengers at 7:00 A.M. and the steamer Wilkes-Barre met the half-hour trolleys later in the morning. Electric lights were placed along Oneonta Hill from the trolley station down to the Lake road. The Acoma was undergoing repairs, and the Natoma was carrying the major steamer trade. Signs were erected to prohibit swimming from the steamer landing at the Picnic Grounds. For the nineteenth summer a group of clergymen from Southeastern Pennsylvania called the “Prophets” were camping on the western shore near the Outlet. Some of the clergymen were accompanied by their families, and, by common agreement, the clergymen did all the cooking to permit the wives to enjoy the vacation. Water activities were thriving in the 1915 season. The Harvey’s Lake Club was again busy planning water sports. Another major water carnival was planned for July 4. The holiday water carnival had beautiful weather, and swimming and boating contests drew large crowds. In early August, John Maughon of Wilkes-Barre swam from the Picnic Grounds to the Oneonta Hotel in two hours and fifty minutes. The state improved the roads to the Lake in 1915, and the new concrete bridge at the Inlet was a scenic attraction. But county inspectors found faults in the construction of the new bridge and ordered penalties against the contractor. In mid-July a lawsuit was filed against the county because a six year old boy drowned when he fell through a defective railing of the old iron bridge a year earlier. During these special years, the Lehigh Valley Railroad promoted the Lake in its travel literature and recommended Lake hotels and boarding houses for the enjoyment of guests. The round trip fare to Alderson from New York City was $7.95. Mrs. Nellie Rankin had a boarding house at Laketon, with a capacity of fifty and rates of $1.50 daily or $8.00 to $10.00 weekly; the same rates were available at the boarding home of Mrs. Elizabeth Fogle which had a capacity of thirty guests. At Alderson the farmhouse of Mrs. Ed Gaynor had a capacity of fifteen and a daily rate of $1.50 and a $9.00 weekly rate. Other boarding houses in the railroad’s travelogue included R. A. Davis at Alderson with a capacity of twenty, and Sunny Bank, a large twenty-guest cottage that still stands behind the R. A. Davis plot near the Picnic Grounds. The Hotel Oneonta was listed as accommodating two hundred with rates of $3.00 as the daily minimum and up to $115.00 weekly on the European plan. Lakeside Inn had a capacity of sixty at $2.00 daily with a $9.00 to $10.00 weekly rate. The Tabard Inn at the Picnic Grounds could hold twenty-five at $1.25 daily with an $8.00 weekly rate. On Wednesday, December 27, 1916, seventy-two year old Prof James I. Alexander, one of Wyoming Valley’s best known figures, fell through weakened Lake ice while he was ice-fishing. He was submerged for fifteen minutes before his rescue and taken unconscious to the Wilkes-Barre General Hospital where he died on December 30, 1916. 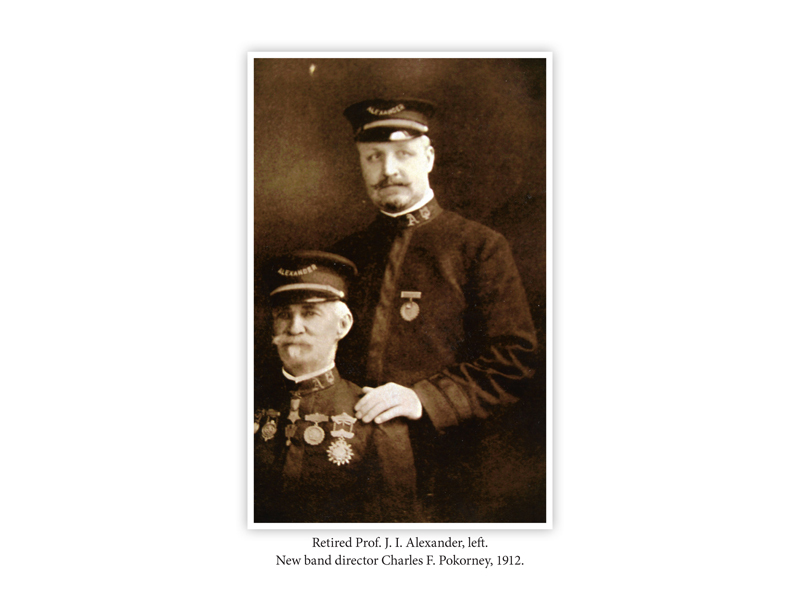 Born in 1844 Alexander was a Civil War veteran of Antietam, Chancellorsville, Gettysburg, and Fredricksburg. A professional musician he came to Wilkes-Barre in 1887 and led the Nine Regiment Band until his 1909 retirement. He was also the organist for the First Presbyterian Church in Wilkes-Barre. His band concerts attracted hundreds of Valley residents and were the central attraction for area parades, holiday celebrations, and were also performed at area theatres. On May 30, 1917, the summer season opened with welcome sunshine after cold rains the previous few weeks. The brisk winds of the morning settled into a calm afternoon. The Lake Transit Company had four steamers meeting the trolleys. The Great War was looming, and the Lake, as with other inland retreats along the Eastern seaboard, was more attractive than shore resorts, which could be invaded by the enemy. The hotel managers at the Lake had an unusual number of early bookings for the season. The Laketon post office at Perrego’s had burned down during the winter and was moved this summer to Rood’s at the West Corner. In late August 1917 Harry E. Brader and Almond Eddy, musicians for the Nesbitt and Capitol theaters in Wilkes-Barre, were swimming at Point Breeze. Eddy suffered a heart seizure and began to drown. Brady swam to Eddy’s aid but Eddy pulled his rescuer under the water twice and both faced drowning. Finally, Brader broke the death grip and was able to haul the nearly unconscious Eddy to safety. In January 1921 Brady was awarded a silver Carnegie medal for heroism. The War Years at the Lake were somber although dances continued at the Picnic Grounds and at other Lake sites. But singing and dancing contests were often omitted as most young men were in the armed services. Before the War the farmers normally would have crowded the weekend and holiday roads with their wagons, sometimes selling produce and other farm goods to the public. But during the Great War it was often believed unpatriotic to be too celebratory; work on the nation’s farms continued on summer holidays until there was victory abroad. With the end of the Great War, the Fourth of July holiday in 1919 was a three-day explosion at the Lake. The cottages were filled with celebrating guests and the Lake hotels were packed. Fortunately, the holiday was free of rowdyism and serious accidents. Traffic regulations and the vigilance of troopers helped maintain the peace. The local farmers had their teams on the road, and the Lake road was filled with parked cars. McDonald’s Jazz Band played at Oneonta Park, and Oppenheim’s was enjoyed at the Picnic Grounds. Within a week, however, traffic was a problem due to growing summer crowds. Trucks were not observing the one-way road regulations. The bathing beaches were becoming more crowded with each weekend. The road between the trolley station and the Lake was in terrible condition from summer rains. The Hotel Oneonta used to care for the road, but with the loss of the landmark in February 1919, the township was responsible for maintenance of Oneonta Hill. There were increasing problems with the theft of rowboats. In earlier years, boats were “borrowed,” but they were always found elsewhere on the Lake shore; now, missing boats could not be found, or they were repainted to defy identification. The American celebration after the War also brought the end of a special era at home. Familiar landmarks of American life would quickly pass as a young generation, flushed with victory abroad, swept aside the slower pace of an earlier era. At the Lake the Hotel Oneonta had not survived the decade, and the popular images of an earlier era, the trolley and the steamboats, would fall into a decade long decline.